New deck and carpets for 2019! Recently added Mother in Law Suite with Queen bedding! 2 Sanddollars is a beach home that provides oceanfront views for semi-oceanfront prices. You can have direct beach access just steps away (340 feet), enjoy the ocean air from the expanded decks, or put your feet up inside with the ample living space of 2 Sanddollars. Located just a shell’s throw from the beach, and close to a wealth of coveted Nags Head shops, restaurants, and area attractions, this sunny vacation home provides the best of the beach with ease. When the summer sun goes down, spend some time in the family room or grab some popcorn and cuddle up for a movie, or enjoy sweet beach dreams in one of three inviting bedrooms. 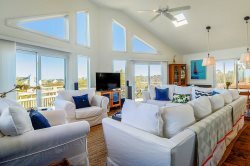 Little touches of coastal decor and comfy furnishings make relaxing a breeze, and the adjacent ocean views are a breath of fresh air for any guest who craves the beach life. No matter what you're doing, you are sure to have an amazing stay at this lovely cottage by the sea. Top-Level: Queen Master bedroom, bedroom with 2 Bunk Sets, bedroom with 2 Twins, living area, dining room, fully equipped kitchen and large ocean side deck. Ground-Level: Exterior Access Only - Queen bedroom with TV, half bath and washer/dryer. Bedding: 2 Queen, 2 Twins, 2 Bunk Sets.